Jovana Rodriguez finds an opening in the Middletown defense and looks to shoot. Sharon Lagunas (4) shoots with Middletown defenders around her in St. Helena's league opener against the Mustangs. Jovana Rodriguez (15) dribbles past a Middletown defender. Zoe Long gets past a Middletown defender in St. Helena's game against the Mustangs. Taking on Middletown at full strength would have been a challenge for the St. Helena girls’ basketball program, but down three starters made it even more of an uphill battle from the opening tip. The Mustangs cruised to a 56-10 victory over the hosts on Friday evening in the opening of the North Central League I slate. Middletown’s defense took advantage of the Saints as they kept St. Helena scoreless in the first quarter. The Saints (4-8, 0-1 NCL I) were down three starters for the contest, with some players out of town and a couple missing practices the week of the game. The Mustangs (6-7, 1-1 NCL I) scored the first 21 points of the game, with many coming off forced defensive turnovers. Middletown caused 37 turnovers for the evening. Jovana Rodriguez led the way for the Saints. The senior scored the first points for St. Helena a little under three minutes into the second quarter. 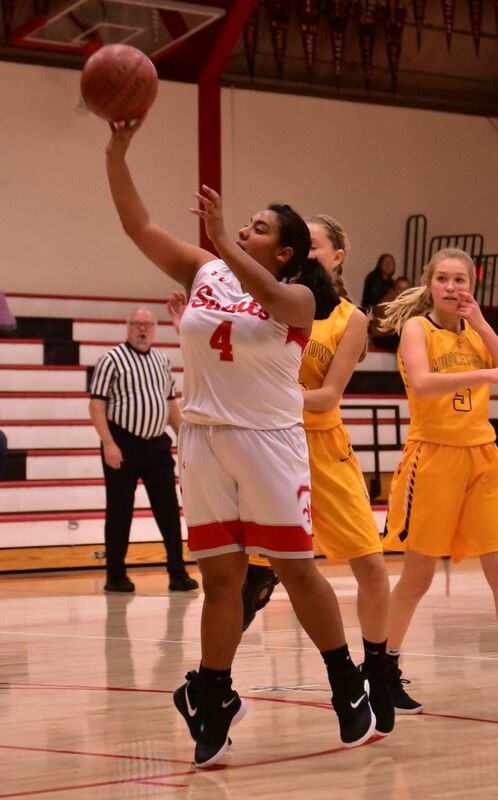 She finished with a team-high seven points. 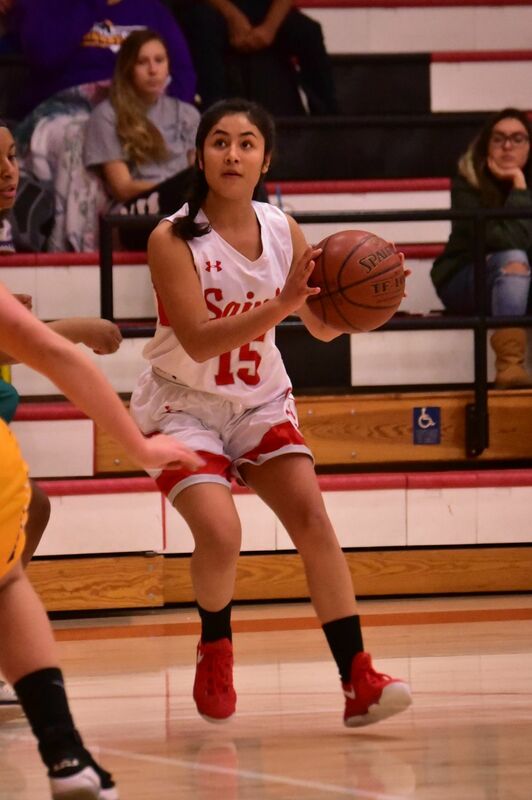 Citlalli Garcia made a free throw to bring the Saints’ total to three points, which is where it would stand at the half. The Mustangs followed up their 17-point first quarter by putting up the same total in the second to hold a 34-3 lead at the break. “I talk to their coach before and explained the situation. He was really good and called off the dogs. They didn’t push,” Smith said. St. Helena played their best quarter of the evening in the third, as the Saints held the Mustangs to only 10 points and managed seven of their own. Rodriguez was the catalyst for the offensive showing, putting up five points in the frame. Lisa Lord also scored two points for the Saints in the quarter. Kassandra Agapoff, Breanna Jones and Abbey Brown each scored eight points for the well-balanced Mustangs attack. The strong Middletown defense reared its head again in the fourth quarter, as the Saints failed to score in the final frame. St. Helena was able to give some of their more inexperienced players time on the court. Elizabeth Garcia picked up a rebound for St. Helena and was one of the few players that had no basketball experience before this season. “I think everyone was positive today and I am a positive person. We played hard and gave everyone a chance to play and hopefully down the year if we get far enough ahead of a team they can come play a lot again,” Smith said. The Saints travel to Willits next Tuesday and then face off with a struggling 0-9 Lower Lake squad on Wednesday. St. Helena will have their full roster back on Monday and has a strong chance to be competitive.